The question of what qualifies as “healthy” food is highly contested in health care and beyond. This conversation is alive and well in our leadership cohort, and we want to engage it publicly. This webinar will bring together four varying perspectives from four thought-leaders to explore how hospitals and health care facilities can lead the charge in expanding the definition of healthy food, to better serve people, patients, and the planet. Join panelists: Kelly Gordon, R.D Six Nations Health Services; Diane Imrie, Director of Nutrition at the University of Vermont Medical Centre; chef Joshna Maharaj, Take Back the Tray; and Dr Janice Sorensen, Langara College; to explore ways to better connect food and health through the patient meal experience, food service operations, food environments, and making connections from health care settings into community. The four speakers bring powerful insights from the frontlines of the Healthy Food in Health Care movement in the US; a community strengthening connection to traditional foods and foodways as a pathway to well-being; innovative clinical research underway in Canada and Denmark; and multiple institutional food overhauls around the Greater Toronto Area. Come with questions and take away a more nuanced understanding of how food can support health and healing, and how to take next steps to advance this conversation in your own organization. Tweet your questions for the panelists and cohort to @NourishLead -- and please forward this invitation widely. Kelly Gordon is a Registered Dietitian and Kanyen’keha (Mohawk), bear clan and a proud mother of two energetic children. 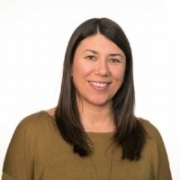 She works for Six Nations Health Services as a Community Dietitian; she previously worked for Toronto Public Health and Davenport Perth Community Health Centre. Diane Imrie is the Director of Nutrition at the University of Vermont Medical Centre (UVM) and is a registered dietitian. UVM was one of the first hospitals to sign the Healthy Food for Health Care pledge in 2006. Diane is actively exploring the gap in understanding about how healthy food is impacting the environment. Joshna Maharaj is a chef and activist who has worked in three different institutional contexts: Sick Kids Hospital, Scarborough General Hospital and Ryerson University. She is an advocate of the role institutions can play in food systems and is passionate about fresh, wholesome and seasonal foods. Summer 2018 Newsletter: What is Healthy Food in Healthcare? What can dieticians learn from indigenous food ways? What is healthy food in healthcare? The question of what qualifies as “healthy” food is highly contested in healthcare and beyond. In June, we brought together the varying perspectives of dieticians and chefs for a rich discussion with Nourish innovators around how hospitals can lead the charge in expanding the definition of how food is produced, prepared and consumed for patient, population, and planetary health. We wanted to share the highlights below. Do want to be part of this ongoing conversation around healthy food in health care? 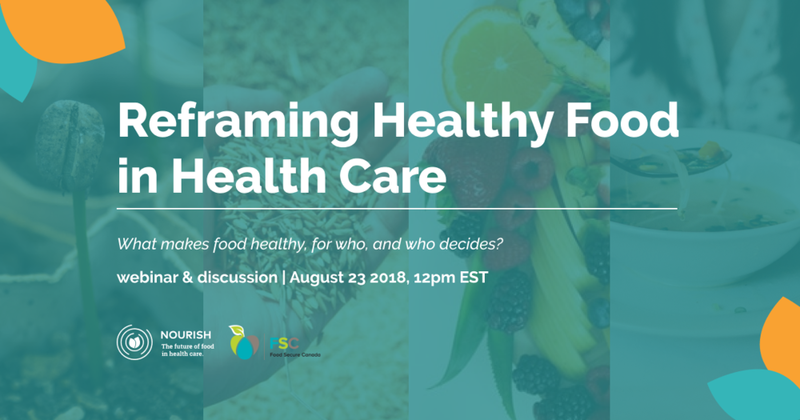 Nourish is hosting a public webinar on Aug 23, 2018 12:00 PM EST to explore broadening our understanding of healthy food in the health care setting in late August 2018. Please RSVP. A farmer friend told me: “food is the way we receive nutrients from the earth.” To remember that the earth is full of nutrients and food is its natural delivery mechanism has changed my entire approach to endorsing how people eat as a chef. My take on healthy food is to move away from word “healthy”, which makes people think about a wagging finger and sacrificing their pleasure when it comes to eating. We need to redefine and broaden the metrics that we use in assessing our food. Good food should be healthy for everyone involved, including those who grew and cooked it, and how much travelling did it take to get the food to the plate? At the University of Vermont Medical Centre, we believe that food is integral to population health management and the future of healthcare. We consider the impact of food on patient health, employee health, as well as community health, climate health and agricultural health. Our goal is to weave food through all the things we offer as an organization and to tie it to our mission to support the health of our population. We set a food plan with priorities every year and we stick to it. There is a difference between healthy eating for healthy populations, which prevents the risk of diet-related and chronic diseases, and eating for health, which is part of the treatment for vulnerable patients to heal. We have to remember that food is only healthy when it’s eaten. From the patient’s perspective, there are different factors that motivate their eating, from their pleasure and comfort, to ease and what feels satiating to them. As care providers, working with malnourished patients is encouraging them to eat energy and protein dense foods, which sometimes might be seen as junk food. How do you choose where to start with food? Especially in finding the complementarities between short term and long term patient needs? Janice: We need to make the case that hospital food is an essential part of care and not an operational cost. The impact of short-term care can have long-term implications that will lead to cost-savings in a clinical context. When I moved to Denmark in 2003, , it was exciting because when they adopted the Council of Europe Resolution on food and nutrition care in hospitals to position the nutrition care in hospitals as a fundamental human right. The policy resolution was instrumental in arguing for adequate resources to help elevate food as an important part of treatment and care in hospitals. Suddenly, hospitals were hiring chefs and winning food service awards. This work can be a difficult process and takes time, but through advocacy and policy, it can happen. Joshna: It’s important to remember the change doesn’t happen in one step and that there are multiple points of entry. It’s about finding the low-hanging fruit to put better food on the patient plate -- if we can’t go organic now, then we’ll get started by working with co-op farmers. Ultimately, we need to find ways to break it down into smaller steps and priorities. The important piece is that everybody’s feet are still pointed in the same direction and their values guide the process. How do we balance the tension between empowering patient food choice and an “expert” approach to prescribing what is healthy? Diane: We have a very liberal approach to diets and moved to room service in 2006, which put patients in the driver’s seat and led to 20% waste reduction. However, diet liberalization does not always get backed up by what qualifies as “expert” research -- for example, we want to be more liberal on cardiac diets, but the recommendations from heart associations may not back our desire to loosen our guidelines. Janice: It’s fantastic to hear that hospitals are prioritizing choice and liberalizing diets. In fact, there is evidence to show that individuals on restrictive therapeutic diets are actually more at risk of malnutrition. TThe importance of diet liberalization is that patients can be offered appetizing foods that they actually want to eat in sufficient quantities to avoid malnutrition in hospital. In an acute care setting, food choice should trump dietary guidelines for health promotion around heart health. How do we promote and enable more sustainable food purchasing in hospitals? Joshna: Talking about sustainability in healthcare can be challenging, where you fight against the charges that sustainable food is a luxury that we cannot afford. However, a small example of a megawin was when I discovered organic oats ordered from a local mill were just pennies different from Quaker oats offered by Sysco. In fact, when we starting purchasing the organic oats, we heard from the food production team that the oats were too dense for the patients. So we went back to the mill and told them about our problem, and they ran the oats through the mill again for a finer grain! It’s important to recognize how the beauty of human connection enabled this transaction, which might not have been possible with a larger distributor and supplier. Diane: You can’t move ahead until you ask where you can find added value and pull it out of the system. Healthcare institutions have reputational credibility and are well resourced enough to pay ahead or offer loans. For example, we wanted to source organic chicken from a farm but we reached a point where we could not arrive at a price point that mutually worked. However, we discovered that the farm was cash solid in late fall but cash poor in the spring when they buy their chicks. Having money on hand in the spring can enable them to buy chicks at a lower cost. So we loaned them $35,000 in the spring for a 2-3 % price reduction and they paid us back in the late fall. Being creative about your supply chain is essential -- what can you offer to your supplier to help bring down the costs and bring value to that relationship? What are your thoughts about hospitals taking a stand around purchasing organic foods or antibiotic-free meat? Diane: There have been articles going around about the rise of antibiotic resistance in the hospitals across the country with evidence about the huge expenses and terrible outcomes for patients. On the organic front, we don’t need more evidence that organics are better for human health other than the fact that that pesticides are bad for the health of farm workers handling it. I have no qualms saying organics are our priority now. Joshna: Organic comes up a lot and I pushed the agenda for organic milk for kids specifically. We worked with local economy dairy and found opportunities through economies of scale. When you have a collective priority, one thing can evolve into the other. I care about local sourcing, but I saw like Diane that once you get into local, you see farmers growing organically. The costs could legitimately come down. Recognition is growing about the need to serve culturally-safe food to Indigenous peoples in care. A number of our cohort members serve significant populations of Indigenous patients and residents, and most Canadian health care organizations serve some Indigenous populations, whether rural or remote. Where is your thinking about how traditional foods fit into this healthy food conversation? Janice: This is still an area of learning for me. But I see it strongly relates to the idea that food is only healthy if it’s eaten, and we already understand the importance of serving culturally-sensitive food. Joshna: I learned an interesting lesson when I was visiting Sioux Lookout and discovered that they have a country food menu for their Indigenous population. They were able to bring food in that is hunted and harvested, and provide traditional recipes for the staff about how to prep and serve these foods. This is a great indicator that we can serve our Indigenous populations and bring thoughtful lessons on how to apply this to the rest of the patient population. What are some of your last thoughts on the critical areas that we need to focus our attention on? Janice: Remember that food is only healthy if it is eaten. Addressing malnutrition is a part of the pathway to seeing food as an important part of healthcare. Joshna: We won’t be able to see the evidence about the role of food in healing using the traditional metrics. We need to be open to broadening our metrics around nourishing food to be more inclusive of the wider food system. Diane: Don’t underestimate the importance of embracing the culture of food in organizations, even if it takes a long time to change. As innovators, keep working on being role models so that policy makers have something to embrace when change happens.